When I held this Dragon for the first time I saw an image in my mind of sparse long grass and dirt, with a few rocks scattered around and a grassy hill rising up to one side. It was a sunny day and a gentle breeze was blowing. The odd thing was that I was seeing it from the point of view of lying on the ground and looking across the surface — kinda like a small rock’s eye view! Perhaps this was my Dragon’s last view of his original home before he (or his piece of rock) was collected? 😮 Then I/we turned to look up at the sky which had become the night sky, full of millions of shining stars …just like the markings in Preseli Bluestone itself. 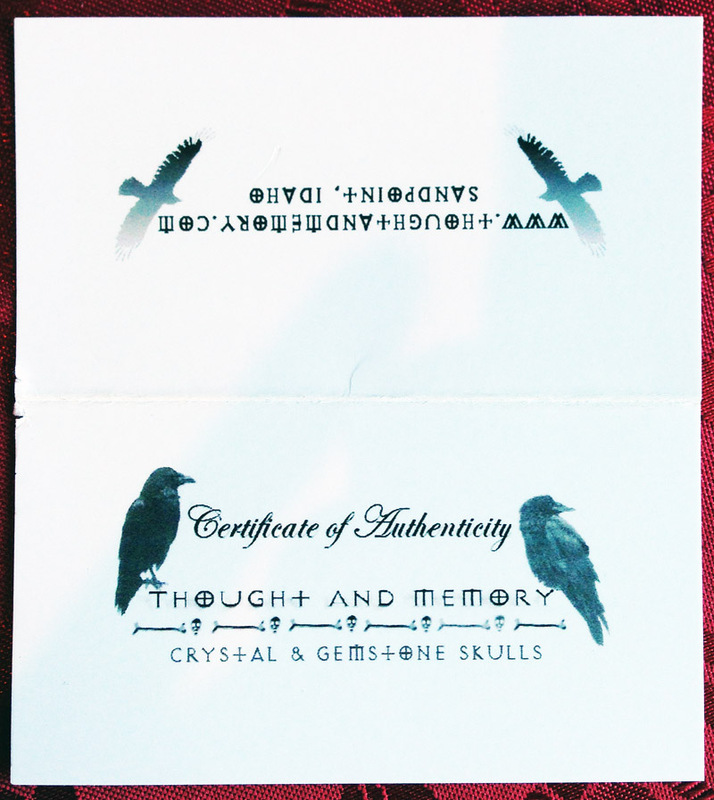 Definitely a unique experience …one I’ve not had with any of my other crystal Dragon skulls! Bluestone has visible feldspar inclusions that shine white like stars in the night sky and the Welsh stones also feature Rhyolite Jasper, a shamanic journeying stone with powerful links to the past. Bluestone could well have been revered as a cosmological skymap, a guidebook for the gods. The central ‘altar stone’ at Stonehenge, long believed to be Bluestone, is actually pale green sandstone studded with Garnet, which also came from Preseli. Garnet has long been revered for its magical and therapeutic powers of illumination and healing. Zircons embedded in the stones are being studied by scientists. The ancients used them as protection against lightning, bodily harm and disease. But it is the Bluestones that are the major power source at this iconic site. The stones would have been venerated for their resonant acoustic properties, which made the whole site ring like a drum. They could have effected sound healing and induced altered states of consciousness through their vibrations. The Bluestones encompass a potent mix of crystal energies to seed into the surrounding landscape at Stonehenge and to facilitate shamanic rituals at the site. They embody a deep longing for reconnection to the spiritual homeland and the ancestors as evidence from burials is now showing that the builders originated in that part of Wales. But they are also powerful healing stones as stones with magnetic fields have been demonstrated to stimulate more rapid healing of broken bones. Bluestone is strongly connected to the telluric or dragon currents of the earth which spiral out from the Preseli Mountains. This current can be harnessed for personal and earth healing (see the Bluestone Journey — page 18). Holding Bluestone increases your sensitivity to vibrations and heightens your awareness of crystal, meridian or sound frequencies. It opens all your metaphysical senses. By balancing the meridians and restoring energetic harmony, Bluestone creates an unshakeable core stability for the physical and energetic bodies. Placed over the thymus (higher heart chakra) it strengthens the psychic immune system. At the base of the skull, it harmonizes the brain stem and activates the hippocampus, an inner compass that assists direction-finding and orientating yourself in the physical world. Combining Bluestone with chalk produces a powerful battery to combat energy depletion in the physical body or the earth. It is no wonder it, as with so many other rocks and crystals, was so revered by our ancestors. This stunning Preseli Dragon comes from the Preseli mountains in Wales. It is a Galactic Dragon and a portal to the Star Being Realms. 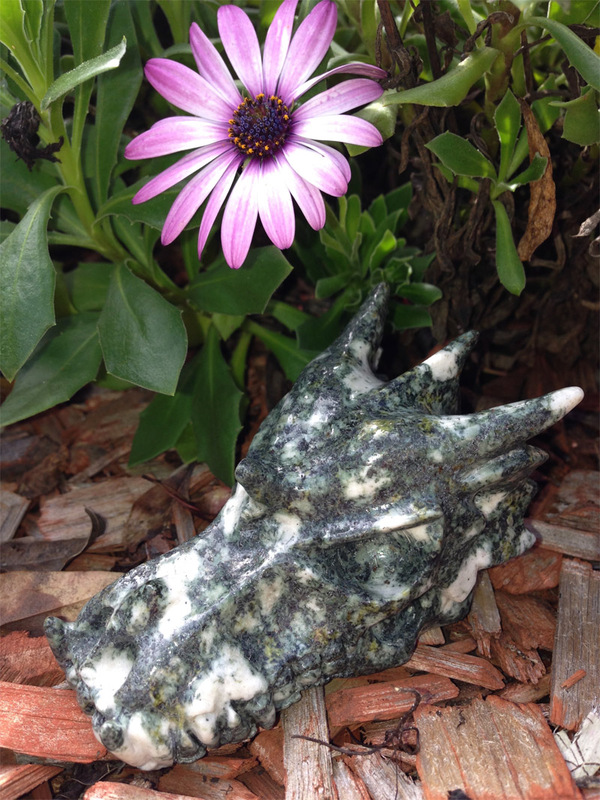 It’s an ancient stone of dreaming and memory re-call and it will align your energy to the galactic Centre. It’s highly beneficial for the immune system and bringing the body into balance. It is an emotional stabiliser and this dragon is here to aid with interstellar communications and wisdom from other galaxies and universes. It opens up the pineal gland in the third eye and is here to aid with the re- alignment of your divine blue prints. Also of interest are the videos about the Preseli Consciousness and the Cosmic Layout of Stonehenge found on the Celtworld Studios website (at the bottom of their “specials” page). All my other crystal Dragons can be seen at A Clan of Crystal Dragons. 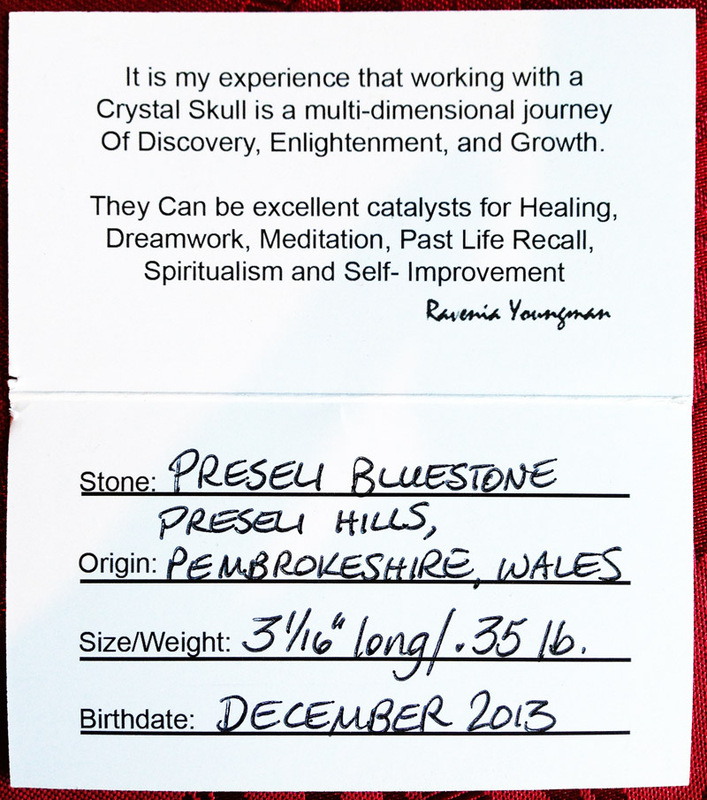 This entry was posted in Crystal Dragon Skulls, Dragon Meditations and tagged Crystal Dragon skull, Preseli Bluestone. I bought one of these today in Avebury. What a wonderful piece he is. A gift for Christmas. Blessed be.